Designed as a patch cable the DEHNpatch can be easily installed and integrated into new installations or retrofitted into existing installations. DEHNpatch is installed between the patch panel and the active component (a switch for example) instead of the conventional patch cable. The snap-in mechanism of its supporting foot allows for the device to be safely earthed via the DIN rail. For a single application, DEHNpatch comes with a piece of DIN rail and a fixing device. A mounting set is also available as accessory for multiple application in 19" distribution boards. 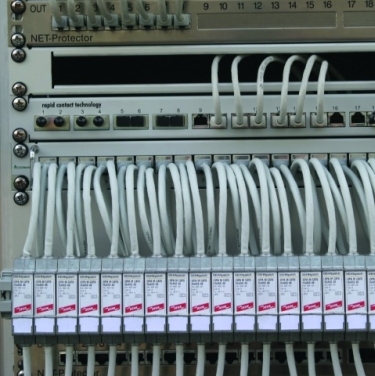 Fulfilling the requirements of Category 6, DEHNpatch can be universally used for all data services up to nominal voltages of 57 V. Both existing applications at offices and industry such as Gigabit Ethernet, ATM or ISDN as well as future services such as Voice over IP and Power over Ethernet can be protected by having the DEHNpatch installed. Due to its fully shielded design, DEHNpatch can be used in shielded and unshielded networks. Its width is similar to that of an RJ45 socket, allowing up to 24 devices to be installed next to one another in one series and to be integrated into a 19" rack. DEHNpatch is available with a total patch cable length measuring 3 m and 5 m (other lengths can be provided and are available on request).